We had a miserable time on Fafa Island. Especially at night when we couldn't sleep. 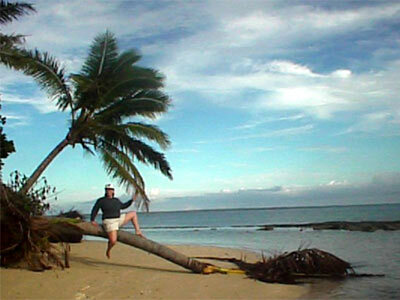 Our superior sunset fale made of coconut leaves was more like a tent than a hotel room. Tara figured that we'd "ease into" a bungalow on the beach for USD 10 per night, so she chose the resort that had the most expensive traditional beach bungalows. Big mistake in hindsight. 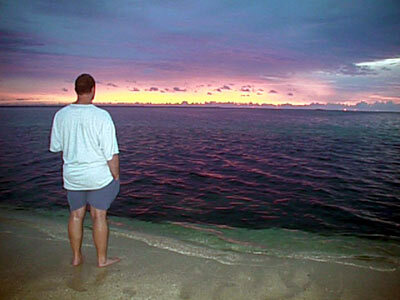 - we were scared in our fale since we were not "within screaming distance of anyone else"
All day, every day on Fafa Island, we put on bug repellent and sunscreen (until we ran out). Thankfully, a nice Australian couple lent us their powerful bug repellent. We had almost bought some Bushman repellent in Australia since the guy at the camping store told us that America has a limit of 12% DEET whereas Australia allows up to 80%, but in the end we didn't. Thankfully we were able to use the strong Australian stuff in the end. Tara also started feeling poetic and wrote a haiku to remember the night when some animal was chewing on our hut. Most of our most enjoyable memories involve being on the beach and nowhere near our room. Unfortunately, the "superior beach bungalow...facing the ocean...a few steps away from your beach" that was advertised on their internet site was NOT on the beach. 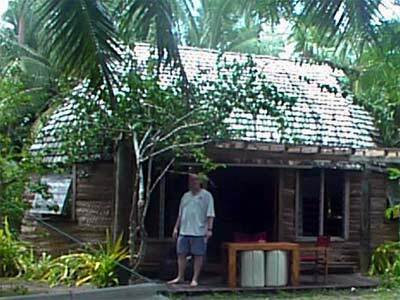 Our Sunset bungalow was situated in a heavily vegetated area set back from the beach. The description of "traditional Tongan building style...walls made from coconut leaves, the roof is covered with wooden shingles" also sounds nice until you actually realize that you are given no lock for your door and do not feel secure that you or your belongings are secure. 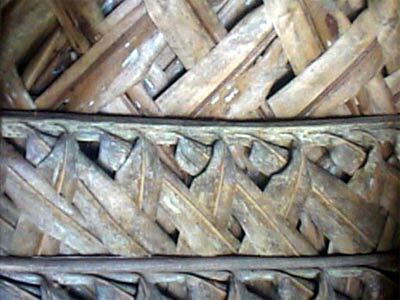 It was amazing to think though that our walls were once coconut palm leaves. 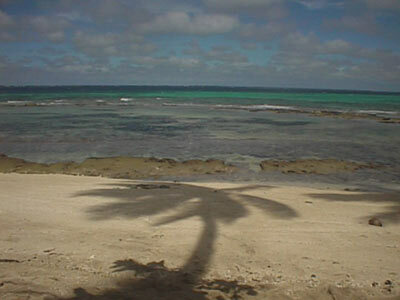 It is not hard to realize why the Tongan people today choose not to live in traditional houses! It is a good thing that neither one of us is scared of animals or bugs. 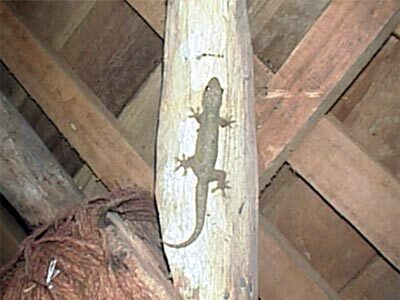 We actually liked many mutant geckos in our hut. We called them "mutant geckos" because they were significantly larger than the geckos we'd seen other places. 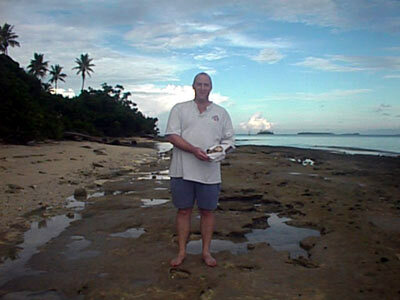 We figure this is due to their huge diet of mosquitos here on Fafa Island. There were many other animals on Fafa besides the geckos that we liked. Periodically, a small hen-colored bird would come wandering through our yard. 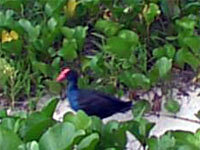 Also at breakfast, a brightly colored blue bird would come up to our table - probably in the hope of getting a snack! 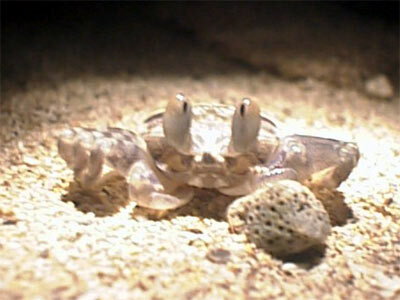 Our favorite animals on the island were probably the sand crabs that we spied on the beach at night. 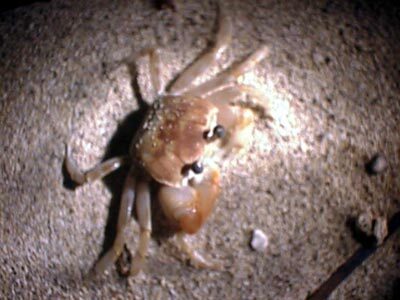 In hindsight, it's a good thing that we were familiar with what sand crabs looked like - otherwise one of us might have screamed the morning that we woke up and had a sand crab hanging from the mosquito netting above our heads! 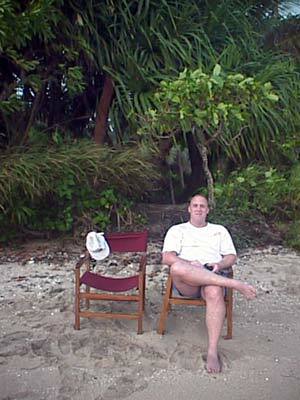 We did enjoy the beach on Fafa Island. 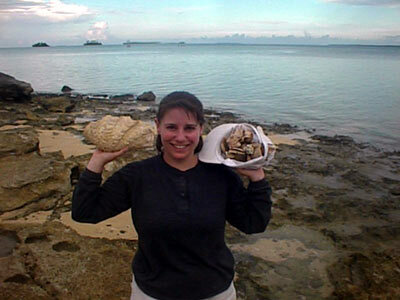 On our first day we walked all around the island and collected numerous shells. We found both very large shells as well as numerous small shells. 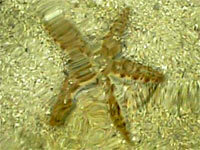 We did have to check every single shell to make sure that it was not already occupied. There were numerous photo ops as we walked around the island just because the golden sand, palm trees, blue water and puffy clouds made for picture-perfect images. 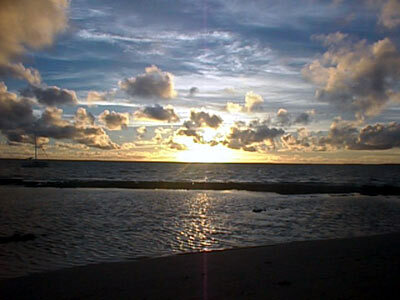 Sunsets from the beach were also enjoyable since they were brightly colored. One evening we drug our bungalow chairs out onto the beach to enjoy the sunset. As time passed, the colors in the sunset drastically changed. We ended up sitting and watching the sun set until it was completely dark outside. It was a good thing Tara had brought her flashlight. 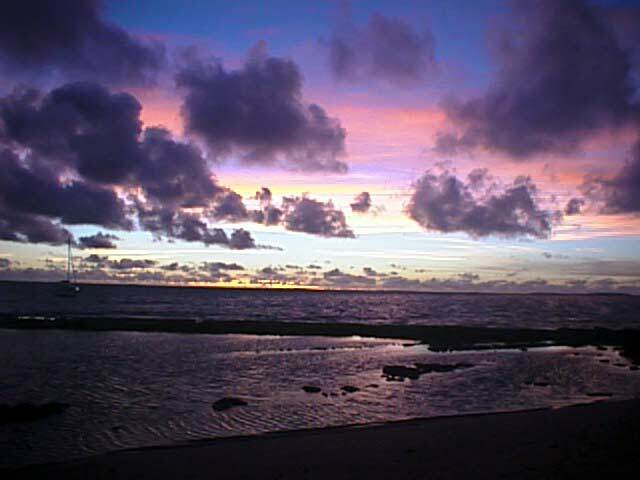 After the sunset, we would head for dinner - spotting crabs along the way. Sitting at the only table that was open to the sky was a treat at dinner. We could look up at the sky while eating dinner and see the stars well enough to clearly see the Milky Way and various constellations. However, star watching on Fafa was not nearly as nice as star watching in Hana, Maui, Hawaii since we'd be eaten alive and scared to death if we would have taken a blanket outside and settled in to watch the stars. While at dinner, we did see both satellites and shooting stars. That was fun! Dinner itself was OK. There was only one night where the only choice was fish, so we opted to have curry and rice with no meat. The walk back to our bungalow each night after dinner was terrifying - even with flashlights. We could never decide if the beach route or the bush route was less terrifying. The creepy walk home set the mood for returning to our unsecured hut. We were never offered a key to our hut, even though there was a lock on the door. Thus, when we got home, we had to check around the hut and make sure no one was lurking in it. This was especially hard the first night when we returned home and figured out that the electricity was not working. At least that was fixed after only one night! Tara was able to sleep on Fafa Island, but she can sleep through anything. Seth had a rougher time. Read his Locomotion posts for the whole story! 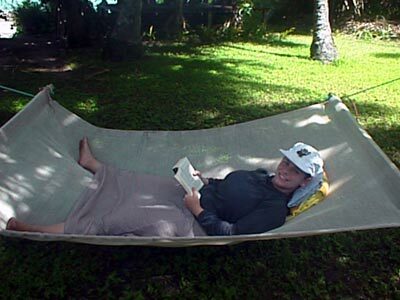 An excellent example is that we had a hammock in our yard. One day Tara settled into the hammock and read for about 30 minutes before getting up and asking Seth "Do I have any bites on my back? My back itches.". 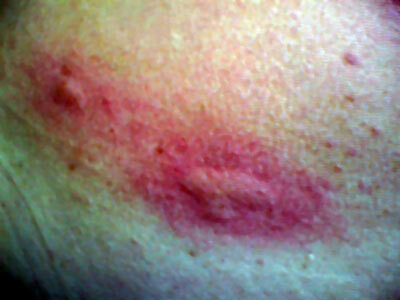 Seth took one look at Tara's back, counted no less than nine big mosquito bites and immediately went to get the antibiotic, pain relieving Neo Sporin cream. Laying in the hammock LOOKED like it would be enjoyable. As we were leaving Fafa, we met a nice German couple who were going into town since they also wanted suntan lotion and Fafa Island had run out. The woman's knees were bitten up so bad that we offered them our tube of Neo Sporin. Tara felt like her bites were nothing compared to the huge welts on the German woman's knees. Thank you again Australia for allowing 80% DEET in your bug repellent!